Using a bot like an ATM Machine? Most traders at some point in their trading career have fantasised about having a strategy or a trading bot (robot) that can be used like an ATM (Cash Machine), to withdraw money at will. Perhaps it is the holy grail that traders look for in their trading journey. I think with a little ingenuity, one can perhaps get very close to this “holy grail”. Over the years I have experimented with various complex automated trading systems that could perhaps be used like an ATM, with limited success. Recently, I decided to simplify my automation and go back to basics. Banks and professional algo institutions (algo is short for “algorithmic” i.e. automated) employ sophisticated quant (quantitative) models for their trading systems. As a retail trader, I prefer a more “back to basics” approach. I have recently been experimenting with a simple yet effective indicator that we have developed called the “X Trend” for MT4. 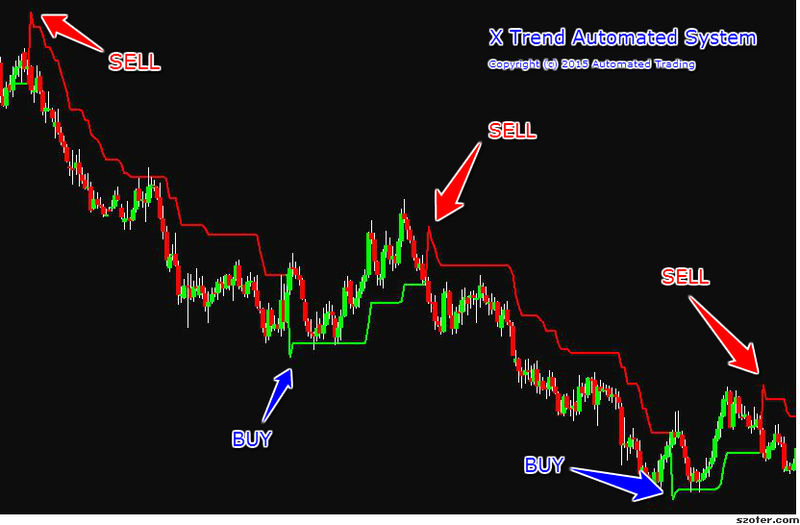 X Trend simply turns green when it is time to buy a particular instrument and turns red when it is time to sell it. Perhaps it is too simple but I have always found that over the years, I have been the most profitable when I have kept things simple rather than over complicate it with complex indicators and calculations. Most indicators are inherently “lagging” entities i.e. they simply provide a picture of what has occurred in the past rather than provide a forecast of what is about to occur. However, certain indicators such as X Trend, represent the price action in a manner that provides easy to read “buy” and “sell” signals. Not sure about you, but I find nothing frustrating than conflicting price action attributes which tell you to go Long (i.e. Buy) and to go Short (i.e. Sell) at the same time! Anything that removes this ambiguity, especially in Algo Trading, is a very good thing. We have just finished converting X Trend into an EA (Expert Advisor i.e. another name for a Trading Robot) and it appears to work fantastically well on the AUD/USD currency pair on the daily chart (shown above). This is great for making money every few weeks, but how to use this strategy/robot to provide a daily “income” i.e. to use it as an ATM? It hit me when I was looking at commodities and indices on lower time-frames i.e. sub-15 mins. On 5 and 15 minute charts, X Trend performs particularly well on certain commodities and indices. Luckily, I have the Christmas period to indulge in backtesting/optimisation in order to find the most profitable trading hours and time frames for the new X Trend Trading Robot.